Few drinks match moonshine for its intoxicating mix of legend and lore, which makes a taste of Ole Smoky Moonshine about the most authentic Appalachian experience we can think of. Variously known as white lightning, branch water, firewater, hooch, bathtub gin and mountain dew, moonshine is going mainstream. Stop by this Gatlinburg distillery to sample the 100+ proof original or one of the fun, 40 proof flavors (apple pie, anyone?) and buy a few jars of 'shine to sip and share back home. 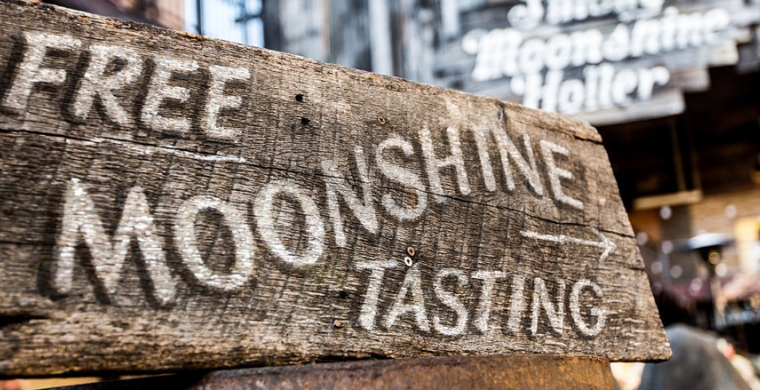 A family business, Ole Smoky Moonshine is the first federally licensed distillery in the history of East Tennessee so, naturally, it's a great place to watch the age-old art of backwoods whiskey making. Open daily from 10 am to 10 pm, though moonshine sales on Sundays are allowed only between noon and 7 pm (by state law). And in the words of the good folks at Ole Smoky Moonshine, Shine Responsibly!